Working primarily in oil, Una uses painterly marks to investigate memory, and how it shapes our lives. 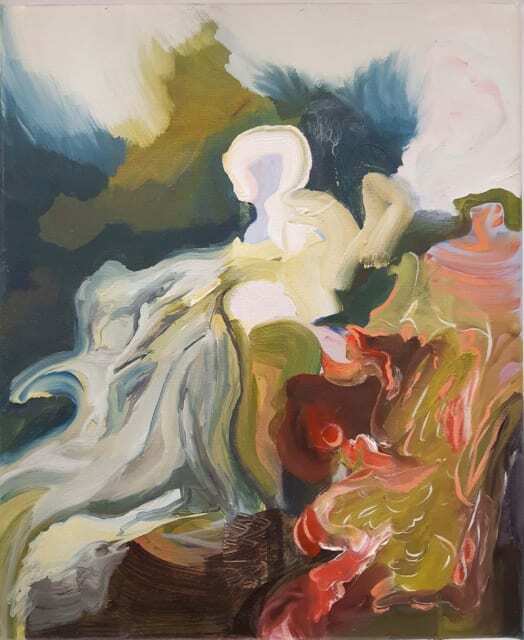 Referencing historical painting, song lyrics and the human figure, she layers her canvas in semi-abstracted forms, reflecting on the non-linear accumulations of images that emerge, distort or fade. Her mark making ranges from rounded and soft strokes to more expressive lines and squiggles. These contrast and float over one another in multi-dimensional planes, that immerse and draw the viewer through her world. ‘I am interested in how fragments of the past, personal, art historical, cultural, remain alive in our deep memory, ghosts that bleed into the present and our thoughts of the future,’ she says. 'Sometimes painting fragments of old masters, blurring, scraping, and leaving residues provides the humus of fertile ground for a new re-telling of the situation. Shapes of faces or limbs body forth in the process of mark making, appearing through a crack in space in a game of lost and found. Una D’Aragona graduated from Falmouth College of Art in 2009 and is currently based in Redruth, Cornwall. Since graduation, she has participated in numerous exhibitions around the UK.